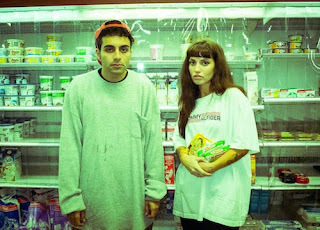 I've been somewhat torn about whether to write about K.I.D aka Kids In Despair aka Canadian duo Kara Lane and Bobby Kaoom, but seeing as I've come back to new demo 'Stoned On The School Bus' several times over the last few days, I'm going to take that as a positive sign. Taking a turn from the punkier elements of their 2014 debut tracks, 'Stoned On The School Bus' is soaring dream-pop. Dripping in a teenage melodrama, 'Stoned On The School Bus' has lyrics that you might have concocted in sixth form - actually lending the track an approachable nature. Regardless, it's the vessel by which those lyrics are delivered that particularly calls for your attention, as Kara's beautifully emotive vocals dominate. The How To Dress Well-esque instrumentation itself is a wonderful complement, and the combination is magical in its own leftfield way. Find more info at whothehelliskid.com.